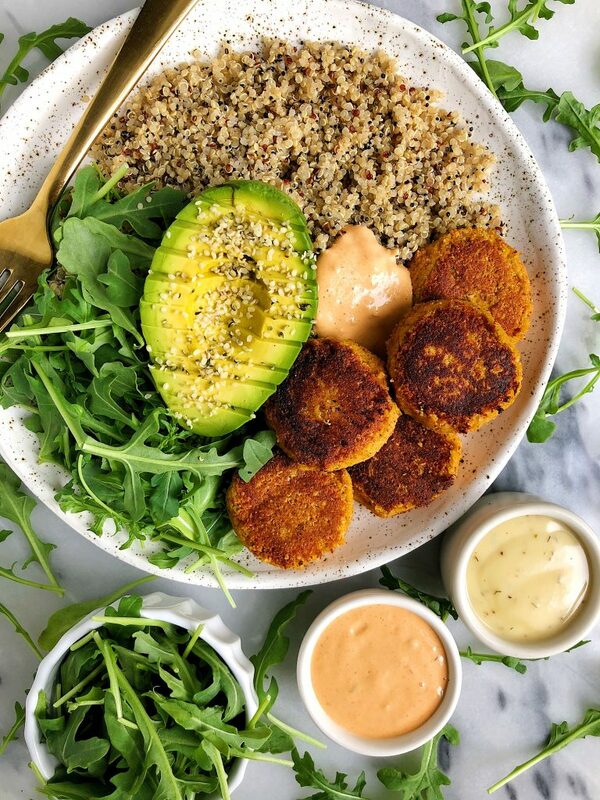 Chickpea-less Sweet Potato Falafels made with grain-free ingredients for an easy and delicious vegan-friendly recipe! Raise your hand if you love falafel but kind of sorta can’t eat chickpeas all the time? Dats me! I’m not allergic or intolerant to chickpeas but whenever I eat them frequently, it definitely isn’t my stomach’s favorite. But that wasn’t easy for me to accept as a self-proclaimed falafel queen who wants to eat it daily. That’s where these Chickpea-less Sweet Potato Falafels come in handy. They’re grain-free, vegan and made with NO chickpeas yet still have that falafel-like consistency. They’re so crispy on the outside and filled with organic sweet potato, raw almonds, almond flour and spices on the inside. I also add in my favorite dijon mustard from Sir Kensington’s in this recipe. It adds the best flavor ever to the sweet potato falafels. I also use some of their other condiments to serve like the special sauce or their new avocado ranch! What I love about these falafels is that they are too easy to make. All you need to use is a food processor to make the batter then crisp them on a skillet and bake. They’re one of my go-to’s to food prep for the week since they stay well in the fridge and make for the best taco topping, addition in a grain bowl or anything you’re craving. But what is it about Sir Kensington’s that has me using basically three of their products for one recipe? You guys have been seeing their products on the blog for almost THREE years now. How insane in this?! Their such an amazing brand that sells so many of my favorite condiments made with ingredients that I can trust. They make everything from various types of mayo, fabanaise (vegan mayo), ketchup and more. Think of any condiment ya love and you’ll likely find it over at Sir Kensington’s. Here are a few of my other recipes on the blog that use their products: Loaded Guacamole Baked Sweet Potato Fries, Vegetarian Buffalo Mac & Cheese, Crispy Baked Avocado Fries and Baked Sweet Potato Tater Tots. 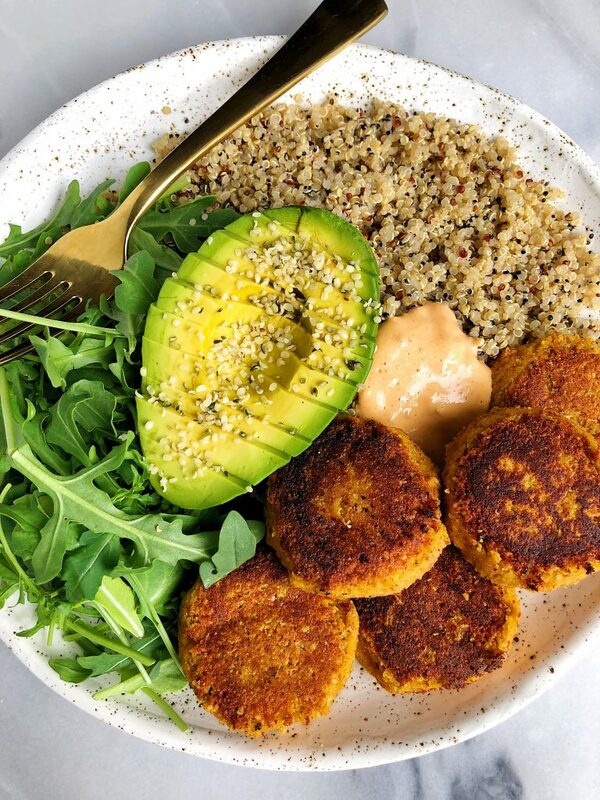 Don’t forget to tag me on Instagram if you make these Chickpea-less Sweet Potato Falafels! Cannot wait to see what you pair them with! 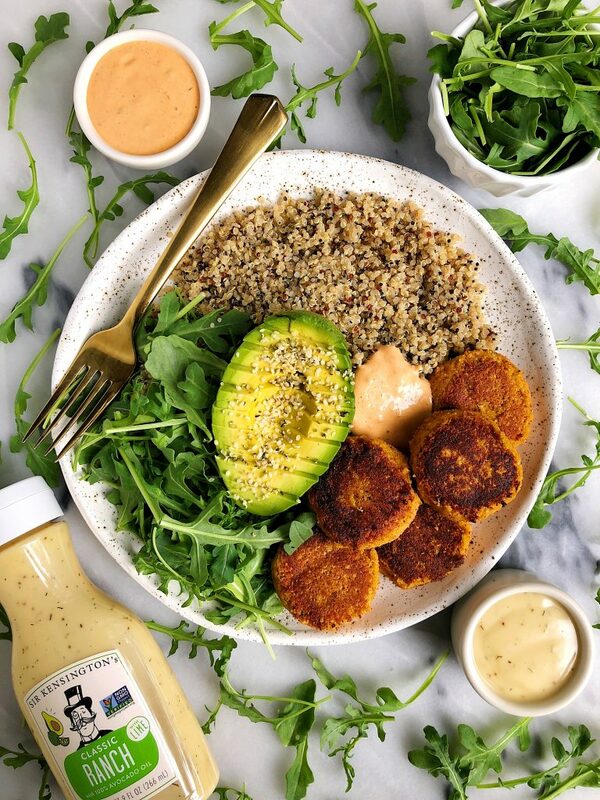 For serving: organic greens, Sir Kensington Special Sauce, Quinoa, Sir Kensington's Avocado Ranch, anything you're craving! Falafels will stay good in the fridge for 5 days or freezer for a couple months! Thank you Sir Kensington’s for sponsoring this post! It means so much to me to work with brands I love and believe in on the blog! YAY! You have no idea how happy I am to see a chickpea free falafel recipe!! Can’t wait to give this a go! Looks amazing and a nice change from chickpeas. Do you know what weight of sweet potato I’d need? They come in so many shapes and sizes I’m not sure what ‘one medium’ looks like! Thanks. thank you!! a medium sized one works. not overly large and not small. doesn’t need to be too calculated. feel free to adjust recipe as needed if you have to tweak based off size. Heyyy! Thanks for sharing this recipe. It looks amazing! Could you suggest a substitute for egg?